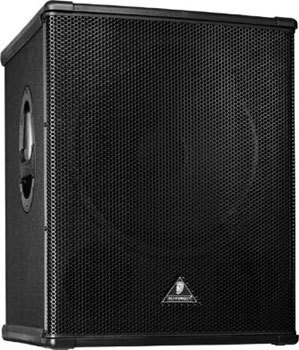 Eurolive B1800X PRO, Subwoofer from Behringer in the Eurolive series. / / For how long have you been using it? / / What is the specific feature you like best, the least? / / Have you tried many other models before acqurir? I had B1800X (not pro) to 400Wrms. Re ^ silent impractical garment carpet cleaning (coating "on the plasticized PRO), and the difference in power is clearly visible (much less powerful than the PRO, with the same amp 800Wrms 8 ohms). / / How do you report qualitprix? Exceptional. For this price, the product is of high quality manufacturing and very powerful. 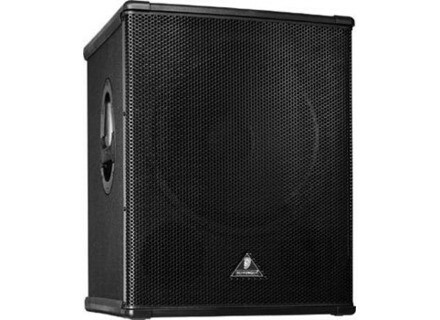 The Behringer has done very very strong, I would see who would be better for this price! / / With the exprience, you do again this election? I use it for evenings animated by DJ with music mainly house, electro, trance, ... I even made an evening outdoors with two of these boxes amplified by an amplifier 2x 800Wrms ohm sub (Stageline STA 2400) and they have ensured their rle perfection (the neighbors are reminiscent of them ...). Only small BMOL is that they turn out well for you must wear an amplifier and a powerful processor, and adcoiffe ... (I use the Behringer audio processor, the Pro DCX2496 Ultradrive). Power handling, size, weight, solidity. - What is the particular feature you like least? The casing is moving full power. No, because in hindsight I would have invested directly in the boxes above the level ds departure. 800W RMS. 101 dB / W / 1m = 130dB! agglomra of wood, not plywood for bnisterie hence the weight. We must abandon the PASSIVE mode or a low pass filter food max power and there is no EHJV, more bass seems blurred Dfine ill.
in active filtering (50 to 100Hz), the corresponding association with rglages 2 15G2 ons. 15G2 ons for 2, a sub is enough!! given sound pressure. I use a total of 4 and 2 sub ons 15G2 1800X pro. not because it is intended MODEL clientle a good target. If you have a budget impact lover who pushes the rib cage and electro house music etc ... works well.